How often do you get your water tank cleaned? Leave that, how often do you get your water storage tank inspected? Well the answer surely for most of you would be, not that often. Around 70% of people do not get their water tanks cleaned ever. That’s a staggering statistic as more than 80% of all the diseases are water borne. Therefore, it is imperative that you get your water tank cleaned periodically. Not until we start getting funky smell from our tap water and faucets do we really remind ourselves to get the water storage tank inspected. Some of them would not do it even then and would look for some short term solution instead. Believe us, you need to get your tanks checked regularly, if you want to stay healthy. Inspection: Get your water tanks inspected regularly, preferably bi-annually or at least once a year. Water stored in closed confinements can lead to formation of bacteria and even insects can start breeding there. To be sure, keep monitoring your water storage tanks. Cleaning: If the tank is easily accessible to you, you can drain out the water completely from the tank and refill it again. That should be a good cleaning method in itself. If you don’t have time and patience to carry out this task, you can always take assistance of a Professional Water Tank Cleaning Company. Frequency: It is recommended that the water tanks should be inspected every 3 months to check for any irregularities, if not quarterly, they should be inspected every 6 months atleast and the cleaning should be performed bi-annually or once a year to say the least. 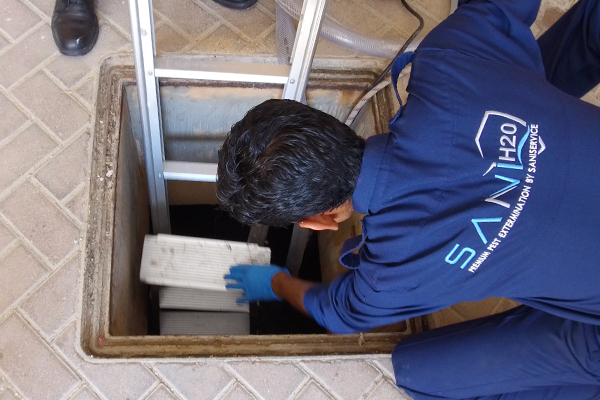 Saniservice offers a free water tank inspection in Dubai. You should call them and get your water tank inspected as soon as possible. Other Aspects: It’s not just about the water tanks, but the water pipe system can also be corrupted due to wear and tear, rust, mold or bacteria. This can also lead to impure water supply in your homes and offices. Same is the case with your taps, showers, faucets etc. You need to get them inspected as well to make sure that the water supply is clean and fit for use. Testing: To be 100% sure that the water supplied to your home or offices is fit for daily use, you can get it tested by a 3rd party laboratory. Saniservice is the only company that offers 3rd party lab testing after Water Tank Cleaning & Disinfection Service so that you are 100% sure that the water you and your family is using is safe and fit for daily use. It is not that difficult to maintain clean water. You just need to be aware and little proactive. It is a matter of your health after all. Contact Saniservice today and get your free water tank cleaning inspection done by the most professional and qualified company in Dubai.